The best way to drive home key learning points is through experience, and the Personality Style Toolkit offers just that! 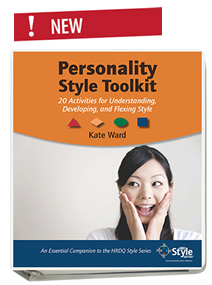 This collection of 20 fast and fun training exercises uses such methods as self-reflection and role play to illustrate how personality style impacts key skills such as team building, communication, coaching, sales, and time management—plus answer the question, how does my personality style affect me at work? What’s My Team Member Style? With more than 20 years of experience, Kate Ward has an impressive track record in training development. Her career began as a manager of curriculum development for CareerTrack, where she authored programs, supervised a team of instructional designers, and facilitated training. She also served as the Senior Instructional Designer at TreeLine Training, responsible for leading the development of the core skills curriculum library. Kate is currently running her own company, working to create innovative training solutions for today’s business needs. My heart beat, beats me senselessly, Why's everything gotta be so intense with me... ~Katy Perry, Glen Ballard, and Matt Thiessen, "Long Shot"